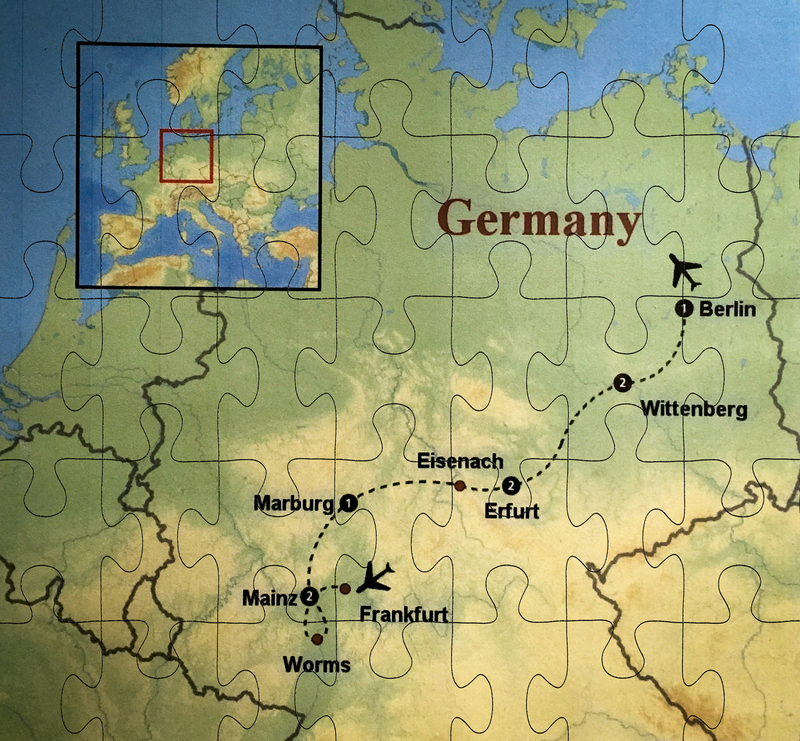 In my last post, I revealed my dream to go to Germany in 2017 to celebrate the 500th anniversary of the Reformation. Making this dream come true requires a plan and a lot of discipline. So what is my strategy? First, I thought about major changes I’ve successfully made in the past. In 2005, I was 25 pounds over my healthiest weight. I joined Weight Watchers online and, one year later, I was at my goal. I have maintained that healthy weight for over ten years now. Success, long term. In 2009, layoffs were imminent at work and I took a new position at a much reduced salary to remain employed. That’s when I learned to really create and micro-manage a budget. Even after fortunes improved, I faithfully maintained my budget and it has served me well ever since. In our marriage, my husband is the saver and I am the spender. Financial responsibilities are divided with me managing the bills and routine living expenses and my husband managing the savings and the non-budgeted expenses. I saved for retirement out of my salary and my husband took full responsibility for maintaining the equity/investment value of our first home so we could retire reasonably when the time came. Whatever discretionary funds I had left after my responsibilities were met, I spent. I was okay at saving for special things on a short-term basis only. Now I am challenged to save for a LONG time and that will require changing my way of thinking. In reflecting on how I made changes to my thinking in the past, I realize I am most successful when I take things in small pieces. Little effort, multiplied many times, becomes a big result. Taking online surveys that average less than a dollar each seems hardly worth the time but I’ve already earned $20 in less than two weeks. Changing my grocery shopping and cooking habits in minor ways will give me another opportunity to save a little here and there and that can all go to my trip fund, too. Staying out of the App Store and saving the $1.99 for each fun little app – another small change that gives me change to save. While I intend to get a summer job to earn the bulk of what I need to fund my trip, creating a habit of daily saving will grow into a character change strong enough to sustain over time. Then, even if my trip falls through, I will have the benefit and satisfaction of correcting a weakness that has plagued me all my life. Piece by piece, the picture will be made whole. Closed doors instinctively spark curiosity for me. Is the door closed to keep something/someone out? Or to keep things safe and out of immediate view? Locked doors step up inquisitiveness even more. Who has the key and what request is worthy of unlocking it? Pausing in the doorway of a new calendar year provides a unique view of the year just past while seeing the vague outlines of the unlocked year ahead. We have some control over how those outlines take shape and, using the past year as a reference, often resolve to add, subtract or change something in the new year. Last fall I completed work on a photography project for a class I took. The project idea was inspired on October 31st, which is the traditional celebration of the Reformation. I have always loved my German Lutheran heritage and seeing the images yet again of Luther nailing the 95 theses to the Castle church door planted the idea to study church doors through photography. Searching out and examining closed church doors taught me to see patterns and clues about what happened when those church doors opened. Seeing the wonderful examples of historic church architecture in my area stirred in me a desire to see and photograph the magnificent structures found in European countries. The 500th anniversary of the Reformation will be celebrated in 2017. What better time to fulfill my dream to walk the lands that Luther walked and see the walls (and doors) and towns and cities that provided the context for his life’s work? Achieving a dream requires a tremendous amount of vision, planning, and commitment. Hard work is the key currency required to work out the details. It also requires examining what else is important to me and what compromises and sacrifices I am willing to make throughout the process. My husband is not interested in a trip of this nature and our retirement budget does not include a trip just for me. Therefore, the first sacrifice required of me is to give up some of my well-loved and well-used free time to find temporary jobs to earn the money to fund my dream. I will not give up my volunteer time at school and I am limited in how much I can earn on Social Security since I am still under age for penalty-free unlimited earning, The tour I have tentatively signed up for is scheduled for late October, 2017, so I have plenty of time to acquire the necessary funds. And there are other changes I can make to carve a trip savings into shape. Luther was all about reform. Not fundamental change, just reform. Taking that as my guideline, I begin 2016 examining my heart and mind to sort through what thoughts and financial behaviors I can reform in order to conform to what I need to do to nurture and grow my trip dream into reality by October 2017. I can dream to my heart’s content and know that God will figure out how to use it for my good, either here on earth or else in heaven. But I have to do more than dream. I have to take on the challenge of change if I want to actually set foot in Wartburg Castle. I am a recently retired adventurer exploring and enjoying life as it unfolds through the elder years. Why the title "Final Seasoning"? Accomplished cooks know to add the final seasoning near the end of preparation to bring out the best taste of the dish. The final season of a series completes a tale told over time. A life span is often described in terms of seasons. At age 65, I am entering the final phase of my time on earth and I desire to use whatever time God has planned for me to become well-seasoned in faith, experience, and service. In this blog, I share my thoughts and experiences on how that desire plays out in my life.